« Where’s the dream pirogue? While Ashley searched for the perfect pirogue in Kisangani – I headed NORTH into diamond country. When fully outfitted Ashley will paddle SOUTH (with a 35 horsepower outboard on his dugout) into the unknown and uninhabited forests of the Lomami River. The North is better known country, but full of secrets. Diamond secrets. 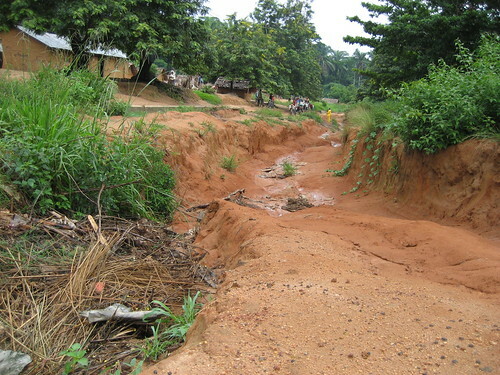 North of Kisangani, the road to Buta that was once tiled and drained is now deeply eroded right down the middle. A multi-agency project (Pro-Routes) is planning to rehabilitate it in the near future. A consortium of major donors is helping develop the whole north-east sector of DR Congo by widening roads that have eroded into incredible disrepair. One of these roads, now little more than a well-worn foot trail, goes through the Rubi Tele Reserve. As a consultant, I was asked to find out the condition of the Reserve before road-work begins. What animals are there? Are they really protected? And if exploited, how and by whom? We went in a caravan of six motorbikes, sturdy little yamaha 100-sport. On each motorbike the driver, the passenger, and a small mountain of provisions were squished together tight as bacon, lettuce and tomato. Four of the motorbikes carried the team-leaders for the forest inventory. They will be in the forest until the third week of June. We will post their report when they get back. 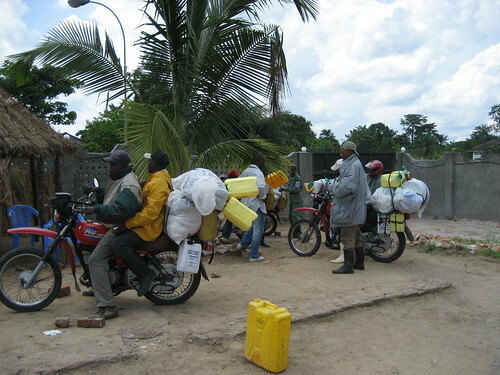 Each motorbike carried a passenger as well as a big cargo of food and camping gear. My mission was to accompany the team leaders to Sukisa, park headquarters in the center of the Rubi Tele Reserve, three days by motorbike from Kisangani and two days return. Sukisa which is little more than a clutter of crumbling mud and leaf thatch buildings is where we did the final organization and launch of the inventory. This Reserve covers approximately 11,500 km2 or about 4,400 sq miles of equatorial forest, much of it golden, high-biomass mbau forest. This type of forest is a specialty of DR Congo although it narrowly follows some river valleys north into Congo Brazzaville and even Cameroon. But here in DR Congo it not only lines river verges but rolls over the hills in between with trunks so close, that the heavy leaves hang like a tarp slung from thick poles. This is the canopy over the Okapi, DR Congo’s own forest giraffe, a regal slow-stepping animal known to be particularly at home in the Rubi Tele Reserve, along with forest elephant, forest buffalo, chimpanzees, other primates and forest antelope. 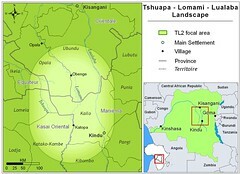 At least the Rubi Tele Reserve was a peaceful home until diamonds were discovered north of Kisangani. 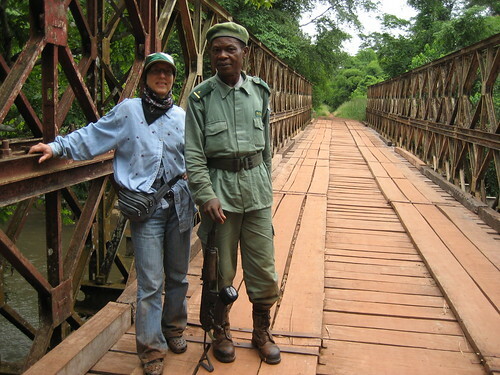 The warden and I are on the Tele bridge, about to enter the Reserve. It is hot. I am in long sleeves and scarf because of the motorbike’s mud and dust. At Sukisa the “régisseur” or warden who is the person who “controls” the Reserve for the Parks Institute gave me the names of the diamond mines he knows about inside the Reserve. There are 35!! With names like “god’s gift” , “Brussels”, “United States”, “talk well”, “white heart”, “promised land”. Most were apparently small with usually about 20 to 30 people. But several were used by hundreds of panners. The régisseur smiled hopelessly “they all eat bushmeat” he said. He has four park guards and one gun with which he is supposed to control the whole Reserve. 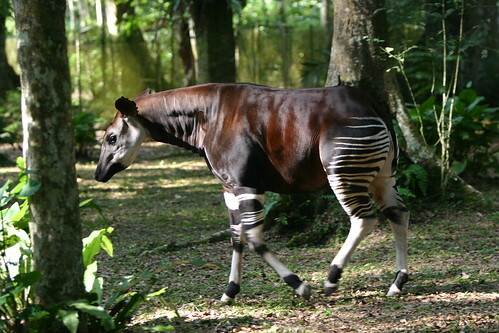 Okapi in the Ituri Forest Okapi Reserve. It is as big as a small horse, but really most closely related to the giraffe with whom it shares a leaf diet, stripping the rain forest leaves from the forest understory with a long prehensile tongue. Photo by Kim Gjerstad. The really big mines though are south of the Reserve. When we crossed the Aruimi (dugout ferry :three motorbikes to one dugout) the helmsman pointed up river. At 20 km upriver are rapids, more than 5000 people are there looking for diamonds… they too are all eating bushmeat. There are divers, dredgers and panners. All are amateur, semi-legal, and distribute pay-offs to local chiefs, regional officials, and military. They work in groups of four to twenty. My motorbike driver said that once we were back in Kisangani he could find me Evariste, the little brother of Pastor Maseko, who has first rights to the entire rapids and has built a huge local church in celebration of god’s goodness. Afterwards my motorbike driver told me that it was a good thing I was leaving Kisangani. It would not be good if people started to think I wanted to buy diamonds. That could be dangerous. 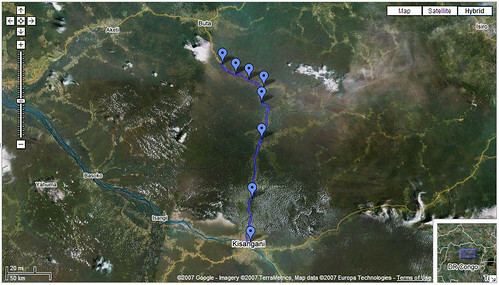 See maps of my trip there on a Google Map I created. This entry was written by Terese Hart, posted on 2007-06-03 at 11:46 pm, filed under About the project, Okapi. Bookmark the permalink. Follow any comments here with the RSS feed for this post. Post a comment or leave a trackback: Trackback URL. This adventure sounds incredible. DT was telling me about it this morning. I hope I get to work with you more in the future! Hope so too! Tons to do here. Actually we have not worked out the double author conundrum yet… this is Terese writing not Ash! What kind of bushmeat are they eating? Explain to her (her name is also Samantha) any problem you had. We have had problems with the system before. Thanks! MEANING NO CRACKS OR VISIBLE IMPERFECTIONS. HOW MUCH WOULD ROUGH STONES LIKE THAT COST ME IN MBUJI MAYI? one of their northern forested territories. SORRY. But from my point of view, it was a very successful trip even if Mbuji Mayi IS a city about diamonds not nature conservation. NOW… if you are associated with a group with some funds that would like to invest in a very good nature conservation cause…..
at first i wanna say that i really love your blog. i just have one little question of interest: why would it be dangerous if people start to think that you want to buy diamonds? i am just interested.